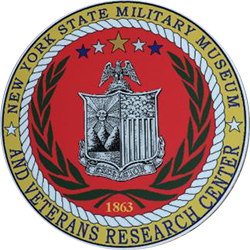 The mission of the museum and research center is to preserve, interpret and disseminate the story, history and records of New York State’s military forces and veterans. Our Sherman Tank returns to the NYS Military Museum from Fort Drum after a year long restoration, to it's permanent exhibit spot. 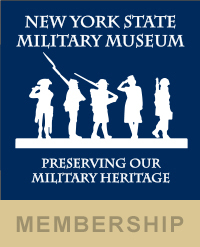 The exhibit features a dazzling array of militia and National Guard distinctive unit dress uniforms, ballot boxes and decorative bronze trophies that interpret the social organization of the National Guard, original artifacts from the USS Maine, and a carronade captured during the 1857 Dead Rabbits Riot in New York City. The mission of Friends is to be a support to the museum, to aid in fund raising for exhibits and displays, as well as assisting in drawing attention to the museum through programs, lectures and events. As the board of trustees, we are the elected board which helps direct the membership to facilitate the support mission of the non profit group. 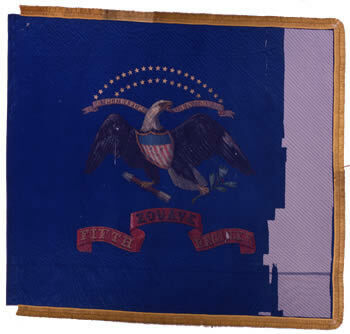 The New York State Battle Flag Collection at the New York State Military Museum includes one regimental color carried by the 5th Regiment, New York Volunteers or "Duryees Zouaves". The blue, silk regimental color includes a painted arm of the United States with 34 gold stars in the typical two arc pattern or 21 over 13. The lower riband, with raised center section, is painted with the regiment's identification, "FIFTH ZOUAVE REGT. N.Y.V. The fly edge is lost most likely from use, or given the lack of a jagged edge in most areas, from scissors wielded by souvenir hunters. In 1967, a flag restorer machine-stitched the flag between two layers of nylon net. Although not a recommended treatment by today's standards, the netting did prevent additional loss at the fly edge.